Of course, you can see the first elephant in this photo plain as day -- but can you also spot the second one? Hint: It's in the water. The incredible image, which was taken at Elephant Nature Park, a sanctuary and rescue center for elephants, just outside of Chiang Mai in Thailand, has received multiple photoshop accusations since blowing up on Thursday. "I want to believe," commented mkePatrick, "but I've been hurt so many times before." But the original poster is assuring readers that the image has certainly not been tampered with. "I love when people wonder if this was photoshopped/edited, because it is an unbelievable photo," redditor RailTieYardGames said. "But I can tell you that this is the 100% raw photo with no editing done to it whatsoever (it's not even cropped)." The elephants use their trunks to throw dirt on their own backs in the mornings, to act as a sun block throughout the day. In the afternoons, they go to the river to wash off the dirt from their backs. The refuge takes in mistreated elephants, and gives them food and a home, as they can no longer survive by themselves in the wild. This particular elephant has a broken hip (left side of pic), as it was forced bred until it could no longer physically give birth anymore and was cast aside. Luckily, she was taken in by the refuge. 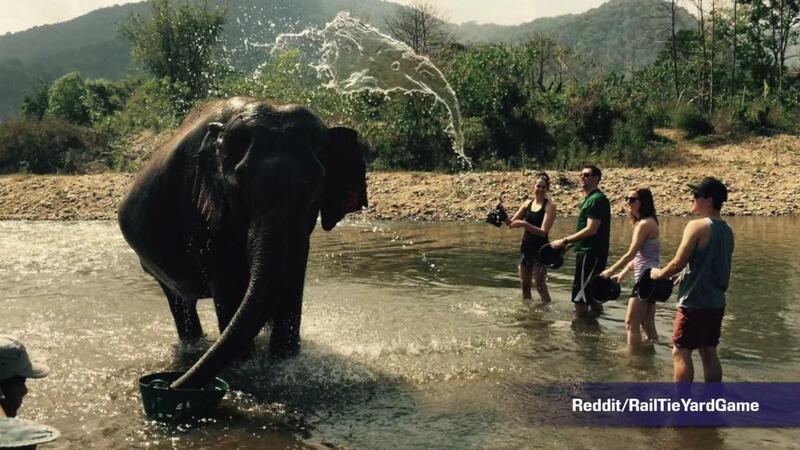 This is why we were throwing water on her back, as she has a tough time bathing. When I took the pic, I was simply trying to take it while the water was in the air, but never expected to take a picture this amazing. It is hard to believe. Trust me. I couldn't believe it either when I noticed it, while reviewing my pictures of the day. But the more I think about it, the more I realize that it's not hard to believe that something so incredible could happen in a place like this. The volunteers that run the refuge are doing wondrous things for these majestic creatures, and I believe the spirit of what they do has been caught in this once-in-a-lifetime photo. In light of that beautiful explanation, we have one thing to say to all the nonbelievers: Your claims are irrelephant.